Bonaventure Cemetery sits upon a bluff above the Wilmington River east of Savannah, Georgia. When the land was owned by Colonel John Mullryne, beginning in 1762, and later by his son-in-law, it was an elegant plantation. A historically popular destination for visitors because of its folklore, moss-draped oak trees, and hauntingly beautiful sculpture, Bonaventure Cemetery's tourism activity increased dramatically with the success of the bestselling novel, "Midnight in the Garden of Good and Evil." The statue, known as Bird Girl (not the one pictured above) and featured on the cover of the book, had to be moved from the cemetery for safekeeping and is now at the Telfair Museums' Telfair Academy in Savannah. Bonaventure Cemetery is located on 330 Bonaventure Road. To get there, travel East on Liberty Street for a little more than a mile onto Wheaton Street. From Wheaton Street, take a slight right onto Skidaway Road and then left onto East 36th Street. East 36th Street becomes Bonaventure Road. Stay on Bonaventure Road until you reach the cemetery's entrance. Bonaventure Cemetery is very large and visitors who have limited time may wish to consider a guided tour, which is a good way to see the most famous grave sites and learn about Savannah's history. 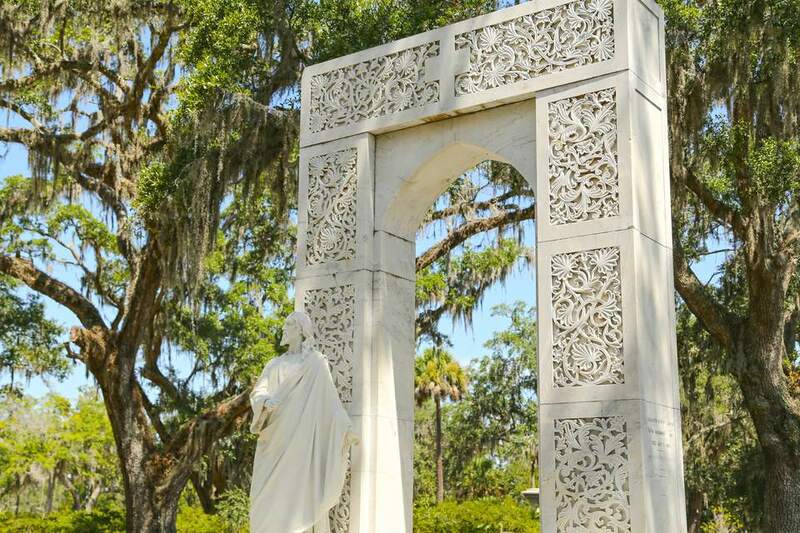 The Bonaventure Historical Society offers regularly scheduled tours, and several tour companies include visits to Bonaventure Cemetery in their tour itineraries. Maps are available online and at the cemetery for visitors who wish to explore at a relaxed, self-guided pace. Little Gracie Watson: A stone memorial marker, located at the gravesite of the child known as Little Gracie Watson, offers a brief description of her short life, the circumstances of her death, and information about the creation of the beautiful memorial sculpture. Because the sculpture has attracted the attention of so many visitors to Bonaventure Cemetery, an iron fence encloses the gravesite for safekeeping. The Gracie Watson Burial Site is located at Lot 99 in Section E, off of Mullryne Way. John Herndon "Johnny" Mercer: The Mercer family plot, which includes the gravesite of popular singer, songwriter, and lyricist Johnny Mercer, is one of the most visited sites at Bonaventure Cemetery. Born and raised in Savannah, Johnny Mercer was one of America's most prolific songwriters, producing many of the top hits from the 1930s to the mid-1960s, including four Academy Award winners for Best Original Song. The Johnny Mercer Burial Site is located at Lot 48 in Section H, along Johnny Mercer Lane. Conrad Potter Aiken: Pulitzer Prize and National Book Award winner, Conrad Aiken was an American poet; a writer of novels, short stories, and essays; and a literary critic. Born in Savannah, Georgia in 1889, he moved at the age of 11 to Cambridge, Massachusetts, to live with an aunt, following the tragic murder-suicide of his parents, when his father, without warning, shot his wife and then himself. In his later years, Conrad Aiken returned to Savannah, where he lived next door to his childhood home. A bench placed by Aiken in the Bonaventure Cemetery family plot takes the place of a headstone. It is inscribed with the words: "Cosmos Mariner / Destination Unknown." The Conrad Aiken Burial Site is located at Lot 78 in Section H, where Johnny Mercer Lane meets Aiken Lane. Alexander Robert Lawton: Overlooking the picturesque Wilmington River, the Lawton family plot includes a sculpture of Jesus standing beside a grand arched gateway. Alexander R. Lawton was an important figure in Savannah's history, having held the positions of ​a lawyer, President of the Augusta and Savannah Railroad, Brigadier General in the Army of the Confederacy, politician, and President of the American Bar Association. Another lovely sculpture depicts his eldest daughter, Corinne Elliott Lawton (born September 21, 1846, died January 24, 1877), sitting gracefully beside a cross. The pedestal is inscribed with the words: "Allured to brighter worlds, and led the way." This gravesite is located on the bluff beside the Wilmington River at Lot 168 in Section H.
There is a multitude of sculptures placed throughout the cemetery, including a statue with a sorrowful expression that changes depending on the viewing angle. In addition to all of the wonderful funerary sculpture, there are many small mausoleums or tombs located in Bonaventure Cemetery. Many of these memorial structures feature symbolic and ornate details, such as stained glass windows and decorative metal doors.